We had stayed at the Hotel Marion in Stefan Voda. Nice enough, but as I said the bed was hard and the wifi was the worst we had used in the last five weeks. Their web page has English, but nobody at the hotel spoke any. Which is fine with us. We don't expect them to, and it's a bonus when they do. Otherwise, hand signals and google translate on the iPhone work great! We had booked an AirBnb shared apartment in the capital city of Tiraspol (pop 100,000). Can't say enough good things about our host. Really helpful, and excellent communication right from the beginning. He said that he would meet us around 1:00pm at the Migration Office and gave me the address which I put directly into the maps.me app and pinned it. After we got through the border, I was to send him a message and he would leave right away. We were coming from the south. Road was in excellent shape! We crossed the border on road R26 heading north from Moldova to the city of Bender. The first guard spoke a little English, but he pretty much just waved us through. Lots of signs saying no photography and no video, so we stowed the camera for the rest of the crossing. A hundred meters further on, there was a customs checkpoint. The Russian speaking guards asked me to open the trunk, they had a quick look, started to ask me to open the bags, then one of them said "clothes" in English. I nodded my head, and they were fine. I opened another bag where we had a bottle of wine, they all chuckled. One of them pointed to another building, gesturing that I was to pull over there. The guy in that building took our passports and sat at a computer terminal for a while. He printed out two slips of paper...one for each of us. They can issue two types of migration cards...a 10 hour transit card, and a 24 hour stay card. There is no fee for this. But if you're staying longer, you have to go to the main migration office in town and get an extension. Again, there is no fee. We then were pointed to another building across the road where a stern looking woman took our passports and car papers to register our car. Again, no fee. Heading through the town of Bender, we pulled over and I sent a message to our host Dmitriy saying we were a few minutes early, but we had made it through the border. Our Orange cellular signal works fine in most areas of Transnistria because we are so close to the Moldova border. Carrying on, we had only been in the country for 10 minutes when we were pulled over by the police. My first thought was that it was because my headlights weren't on. I think it's the law here that you have to drive with your headlights on after November 1st, and I had forgotten to put them back on after we left the border. It was a guy on foot who had flagged us over. He spoke no English, and we spoke no Russian (although we have since learned how to say "thank you"!). We showed him our passports and migration cards, but that's not what he wanted. Eventually, we gave him the car papers and he seemed happy. He also wanted my drivers licence. He had a quick look, and sent us on our way. A bit of a nerve wracking moment! Apparently it's fairly common for a car with Moldovan plates to get pulled over to check that your papers are in order. We made it to the migration office located at Strada Kotovskogo 2a in Tiraspol where we met Dmitriy. He is a young guy, maybe around 30 years old who was born and brought up here and works in IT. He has a wife and a 3 month old baby girl! And he loves to travel, and to host people from around the world who visit Transnistria. He filled out the forms for us, and soon we had our 3 day migration card. 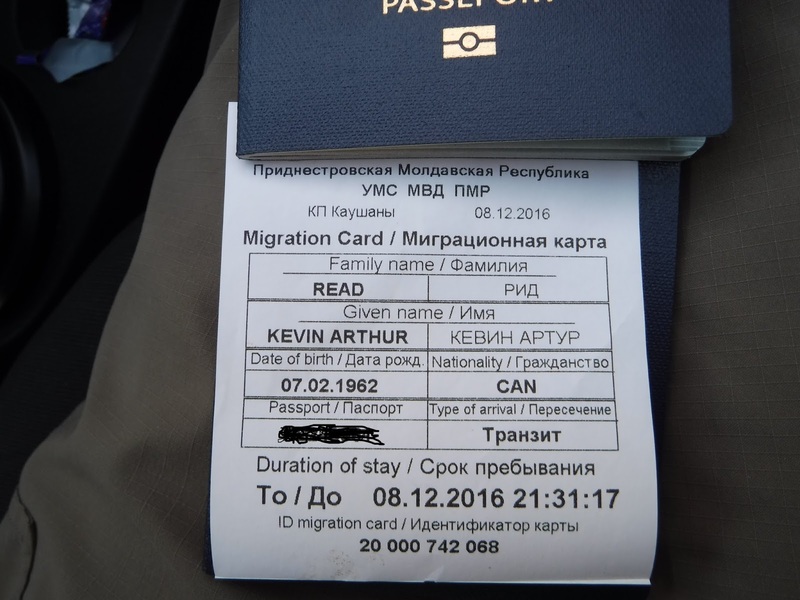 Three day migration card for Transistria. We followed his car back to their flat where we relaxed in our comfortable room for a while. The money... Transnistria has it's own currency. The Transnistrian Ruble. The government sets the exchange rate, however there is a currency devaluation on going. You won't find it listed anywhere, but currently there are approximately 14.5 rubles to the U.S. dollar. We only have Moldovan Lei with us, and they are exchangeable as well. In fact, just about any widely used currency can be changed into Transistrian rubles at one of the many exchange houses around the city. But, it's tough to change it back, and you can't change back what you don't use. So you could end up stuck with extra rubles that are of zero value in any other country. He told us there is a La Placinte restaurant just around the corner from his place and a supermarket just down the road. So we walked over to the restaurant and had a late lunch. Unfortunately, it wasn't quite as good as the meal we had in Chisinau. And interestingly, they had English on the menu in tiny letters! But there are also lots of pictures on the menu as well, so that made it easy. Our waitress only spoke Russian though. The cheap stuff on the bottom shelf is about $1.50 a liter. Today, we're just going to head out on foot and explore the city. It's cloudy, but warmer at about 6C (42F) at 10:00am. Calling for a high of 9C (48F). Looks like you are enjoying all this travelling and new experiences, keep having fun. This is definitely a new experience that is for sure! So interesting and exciting! Can't wait to hear more about Transistria. Have fun exploring!!! Yes, it is interesting and we enjoyed yesterday when we went out and explored Tiraspol. Kevin is already working on the post for that. See, that "no fee" part when you have to fill out some sort of bureaucratic paperwork is the way to go. Every time I've had to do that, I've immediately thought, "Cash grab", because that's the way we're programmed. So, are you starting to figure out the Cyrillic script yet? We were very surprised to see that they don't have a fee for this, not many places left like that. As you said for most it is just a "cash grab"! I have been able to figure out a few because we have seen the same script on several buildings that house the same type of business but no we haven't figured it out and for the 3 days that we are here, we really didn't feel that it was worth trying to figure out. Oh I cant wait to hear the rest of this little journey!!!! Yep, good cheap vodka at that! We would be taking from the bottom shelf as well if we drank vodka! OMG! Real vodka!!!!! Oh how I want to visit Moldova and Transnistria!!!!! Thanks for posting. We are liking the area very much. Have fun and be safe. It's getting cold here (0C) at night and we thought about our times around the fireplace with. We miss you guys already. Chris would feel like you are in heaven here with all the vodka! We are missing you guys as well and the nice warm weather in Mexico, even if the night time temperature is hovering around 0c, it is still warmer than here. You guys are seeing the world! Have fun!